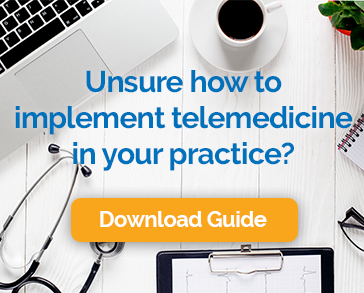 Selecting telemedicine technology for your practice is probably not something that you do every day. With all of the various options out there and the rather technical language that is often used to describe these solutions, it can be difficult to know which offer will be best for you. To help, we’ve created this quick guide that highlights the most important vendor characteristics and software features to compare. When reviewing your telemedicine software choices, be sure to think about how user friendly it is for three constituencies; providers, staff and patients. If you select software that is too cumbersome or confusing for any of these groups, you’ll greatly reduce your chances of getting the benefits you want from telemedicine. Getting paid for video visits is obviously essential, but a lot of decision makers don’t think enough about technology’s role in reimbursement. Choosing a solution with automatic eligibility verification and a team that understands reimbursement is essential. For example, we have spent years developing the Chiron Rules Engine, technology that leverages the industry’s most up to date database with information about state laws and private payer practices. This allows us to check the eligibility of every patient for telemedicine reimbursement when the appointment is scheduled. We also have a team of experts standing by to intervene with payers if a claim is denied. Finally, if we are unable to resolve a claim after a verified appointment, we’ll cut you a check ourselves. We think every practice should demand this level of service. Because patient data will be transmitted during a video visit, it is essential to choose a HIPAA-compliant solution. What’s more, HIPAA rules require that covered entities (you) and business associates (your telemedicine software vendor) enter into contracts to ensure that all protected health information is safeguarded by everyone who may have the opportunity to access it. Be sure that you only consider providers who are willing to enter into a Business Associate Agreement with you. If your in-office appointments are scheduled in your practice management system, your video visits should be too. Choose a solution that integrates with your EHR to avoid the hassle of managing multiple scheduling systems. Your patients know and trust you, not your telemedicine technology vendor. Make sure to choose a solution that lets you put your branding in the application that your patients will use. This will increase their confidence, and keep the brand you’ve worked so hard to build front and center. Adding the option to conduct telemedicine visits to your practice should bring many benefits and little hassle. Choosing the right technology vendor can make all the difference. We hope you’ll consider Chiron Health, but even if you don’t, this guide can be of value during your search.